What I actually purchased was a copy of this original 1940's vintage pattern, but there it was in writing - seven fold - I was excited. I decided to mock one up in calico to check where all the folds went, which is when I discovered the pattern only had four fold lines. Nooooo! When Mr Tie Expert arrived he confirmed my suspicions, the pattern just wasn't wide enough, in fact it was extremely narrow - think 1940's with a hint of 1980's Kraftwerk thrown in for good measure. Little know fact: the first time I met my husband was at a 1980's party - I came as a member of Kraftwerk complete with slicked back hair, red shirt and thin black tie…. Anyway, back to ties. We decided to use the vintage pattern as a starting point and add three more fold lines of our own. 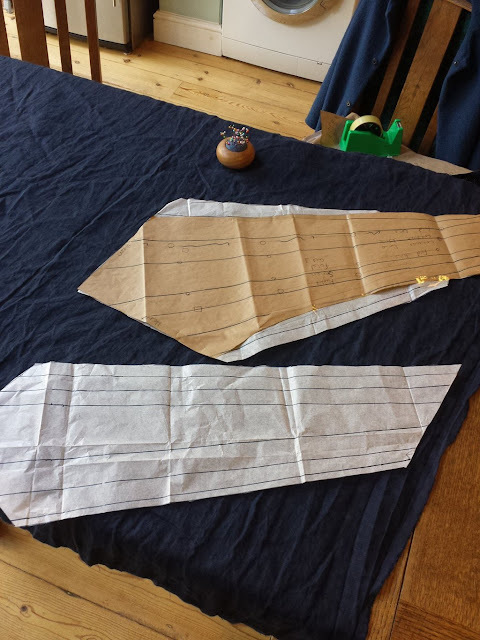 Using a diagram we'd found online as a guide and a bit of slapdash maths, we made our very own seven fold tie pattern. 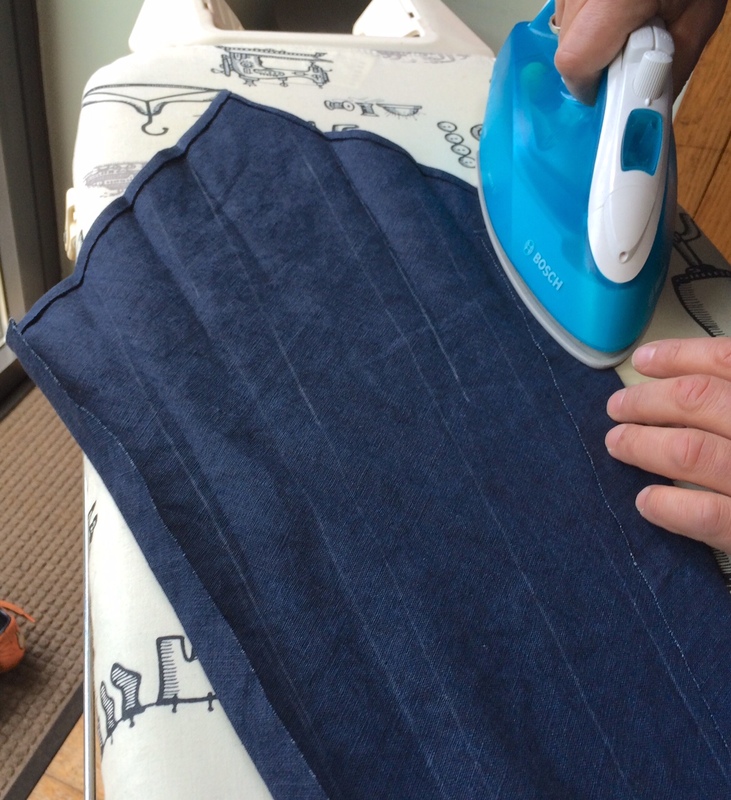 and a loooong time at the ironing board trying to work out the order in which the bloody thing needed folding. I should point out that Joe was a dedicated tie-making professional at this point, concentrating fully on the task in hand. Even my constant interruptions to show him the changing hairstyles of Hall & Oates over the years didn't distract him, he was a man on a mission. The fold lines weren't perfectly exact, so there was a bit of fudging to be done, but he got there in the end. Ladies and gents, I give you a genuine, handmade seven fold tie! Joe's choice of fabric - a dark navy linen from Liberty - was a lovely quality, but I did have my suspicions about how well it would drape. I needn't have worried, the fact that the pattern pieces are cut on the bias makes it hang beautifully. I also really like how the bias grain of the linen looks in a solid colour. He catch-stitched the edges together and finished off with two tiny white buttons. Ooh, as fellow tie maker I am SO impressed. I can't quite get my head round how it works but well done - I'll be on the hunt myself now for a seven fold tie. I love the button - what a funky little detail to finish. Well done! Hat's off to you both for working out the pattern and folds. Maths is not my strong suit! I love the little button detail. 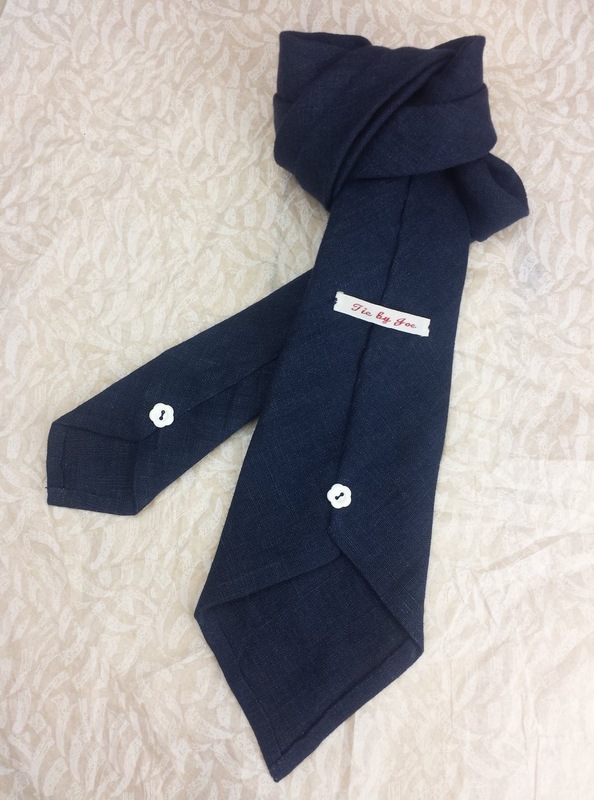 Who knew that a plain navy blue tie could be so special. 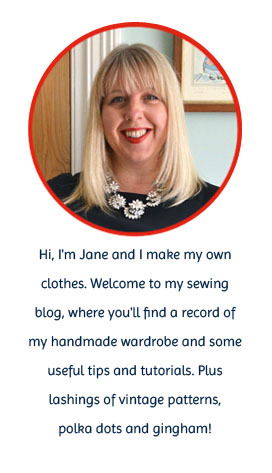 I bought a tie making kit from Sew Over It at the end of last year. I really must get round to having a go. 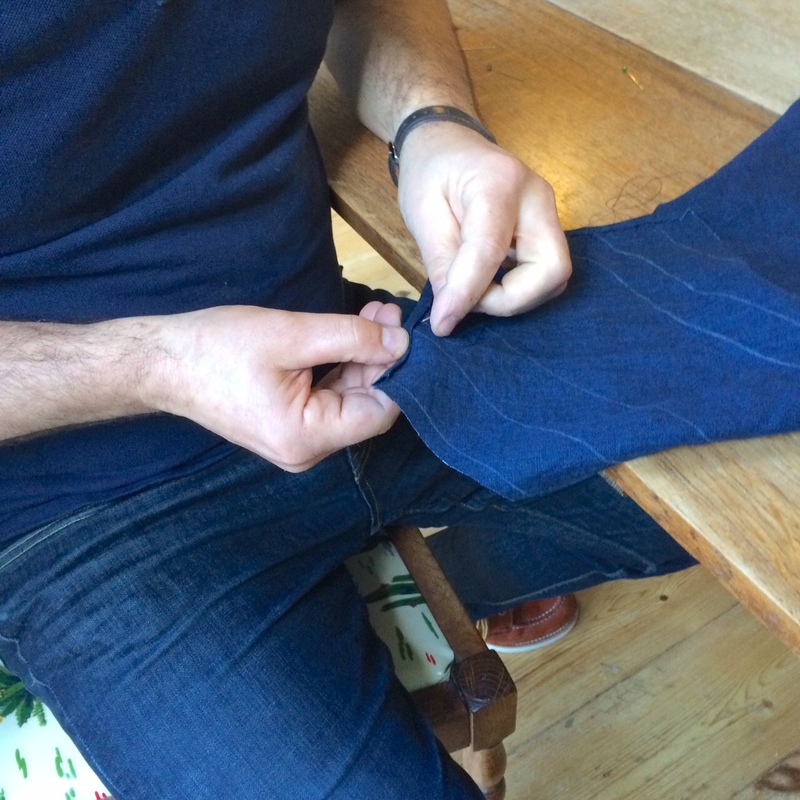 I just love experiments like this - right up my street although I have never made a tie. (The world is full of ties and tie-less men these days it seems). Fantastic. Bravo. Just wonderful. As a recent convert to homemade pleating boards, my method to simplify the folding and pressing would be to make the pattern out of lining paper glued fabric, then fold up the tie piece inside it, pressing along the way. 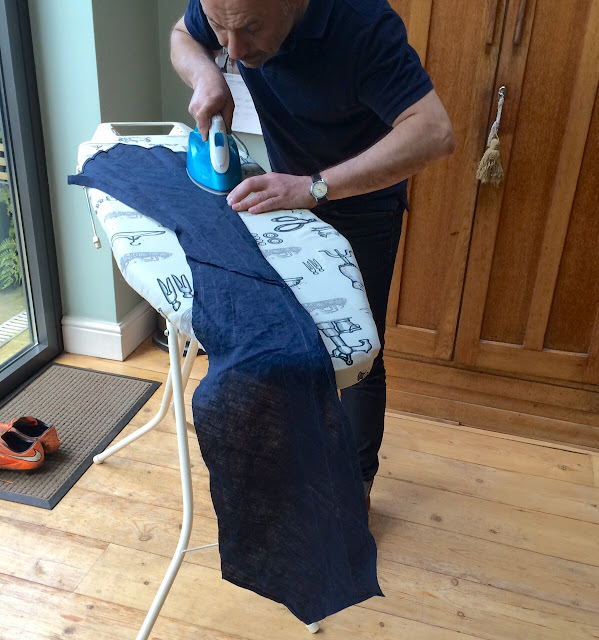 This would avoid any shininess introduced by the pressing, and make life easier...what do you think? That is so cool! What a special (and specialized!) thing to make. I think my favorite is the photo of him pressing it... you don't realize just how BIG a tie is until you see it like that, wow! kraftwerk .....trust you! Laughing very hard at that one and btw makes me like the sound of your hubby very much! Love it. So chic and clever origami work! Wow! That was really fascinating! I like the 7 fold the best. Especially so, after seeing the construction of the one your hubby "pounced on" for Christmas. That Christmas one is fab (and so are all his photos and role models), but the 7 fold looks like it came from Nordstrom! Dang!! Ooh now I fancy trying a rare 7 fold tie! Joe will have to share his pattern with us at some point! Oh wow! My Dad is pretty much always sporting a tie and loves the liberty / boy art lined one that I made him based on the SOI kit last Christmas. It's wonky as heck (silk is not the best thing to choose when making your first tie!) but I was so proud of it. If Joe ever fancies sharing his pattern I'd be snaffling it up pretty much instantaneously! Would live a copy of the pattern - and any tips! Thanks for the article - gives me hope to successfully make a 7 fold someday! I would LOVE a copy of the pattern. Any chance you'd share?